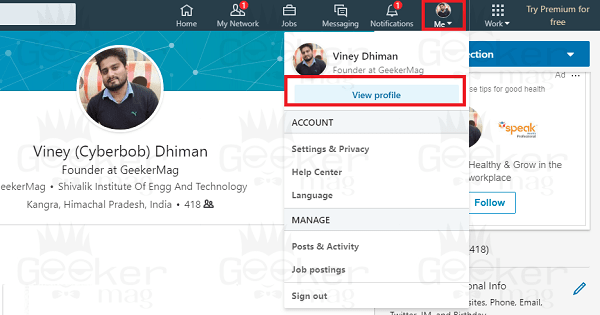 Looking for a way on how to upload resume on LinkedIn profile? The following post has instructions on how to do that. 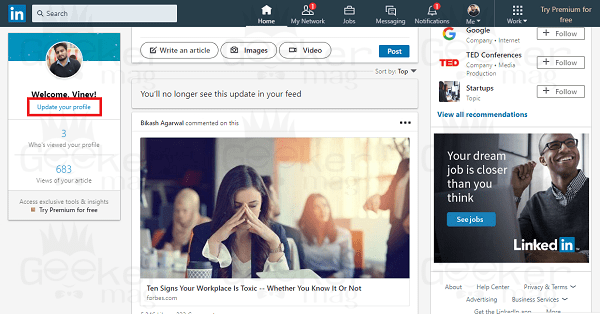 LinkedIn is popular employment and business-oriented web service that let you manage your professional identity online. On the site, you can build your professional network and engage with them. You can access insights, knowledge and various job opportunities. It is the best place where you can search for job opportunity posted by other users. You can update your academic and professional qualifications, achievement certificates, and the professional skills. The good thing is that you can also add resume on LinkedIn. And if you frequently visit the website for a job opportunity, then it is a good idea to upload resume on LinkedIn to highlight yourself from others. But not all the users know the steps on how to add resume on LinkedIn. 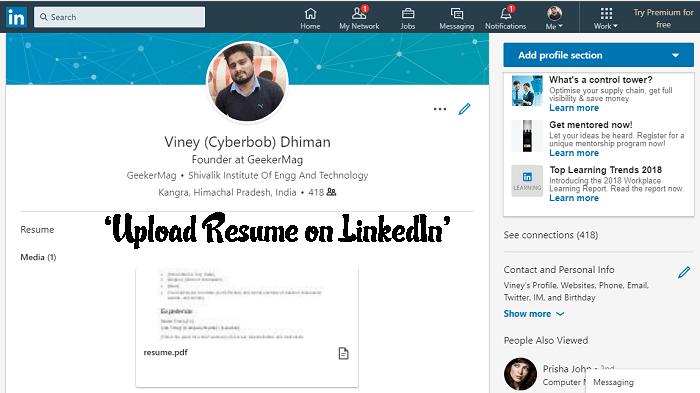 To help those users I decided to write this detailed post on how to upload resume on LinkedIn. 1. 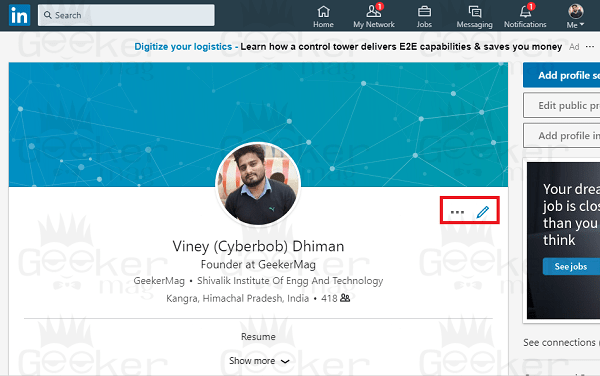 First of all, you need to visit (linkedin.com) and log into your account using the credentials. 2. On the left pane, click on the ‘Update profile‘ link below your profile picture and welcome message. 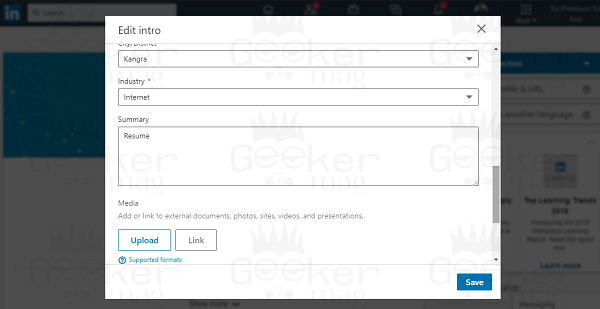 Alternatively, you can also click on the down arrow next to ‘me’ tab available in the menu bar. Now from the options click on ‘View profile‘ link. 3. Here on this page, click on the ‘Edit‘ (pen icon). 4. 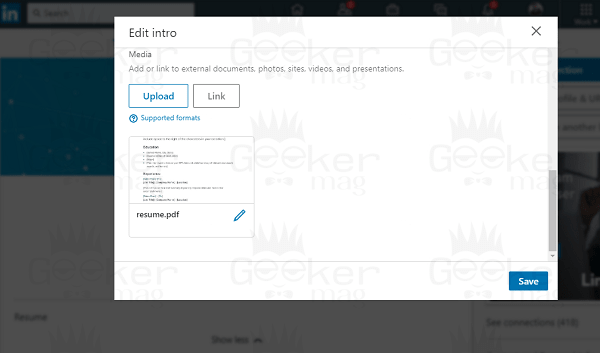 The above step will help you to launch the ‘Edit intro‘ window. Here you need to scroll down until you reach ‘Summary‘ section. In the space provided in the Summary section simply type ‘Resume’ or little summary of your professional skills, achievement certificates, and academic & professional qualifications. 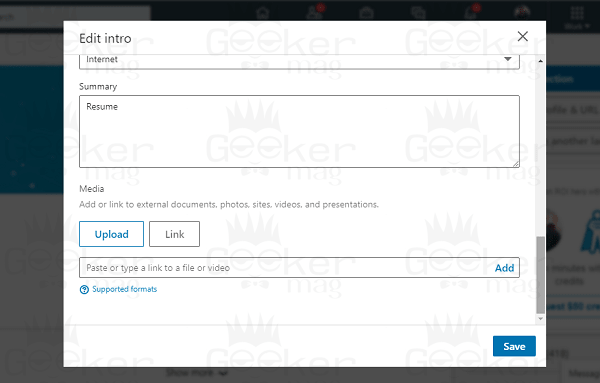 After that click on the ‘Upload‘ button, this will launch the browser windows. You need to navigate to the directory where you have placed the resume. Before finalizing the upload, it will show you the preview of the file. So you can also confirm if everything is okay or not. Once done, click on the ‘Apply‘ button. For more details about file formats visit this page. Similarly, if you own webpage for your resume, then you can click on the ‘Link‘ button next to Upload button and paste the url of your resume web page. Once done, click on the ‘Add‘ button. Note: In case, you want to update your resume, then you can delete the resume file and following the same procedure add the updated resume file. 5. After uploaded the resume, click on the ‘Save‘ button. This is how it is going to look in your profile picture. 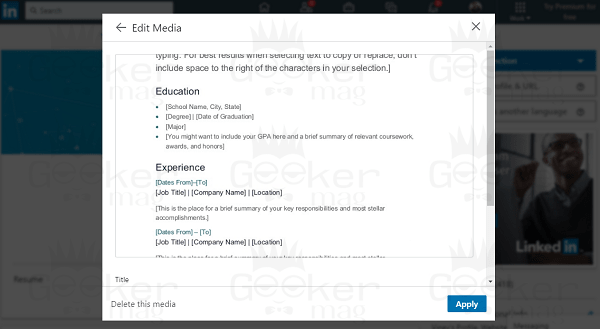 Any visitor can click on the preview to check the complete resume. 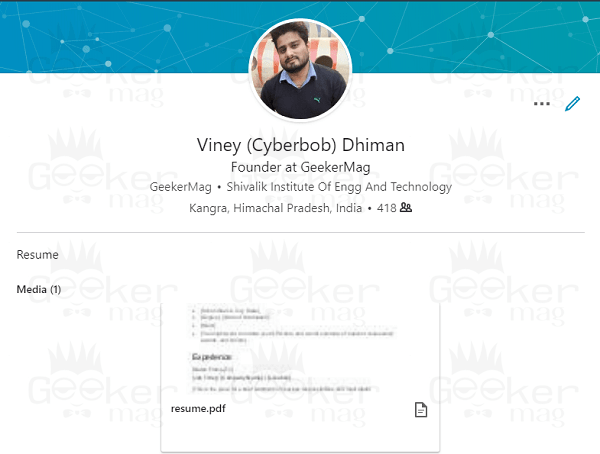 I hope my this post on how to upload resume on LinkedIn useful. Let me know your thoughts in the comments.